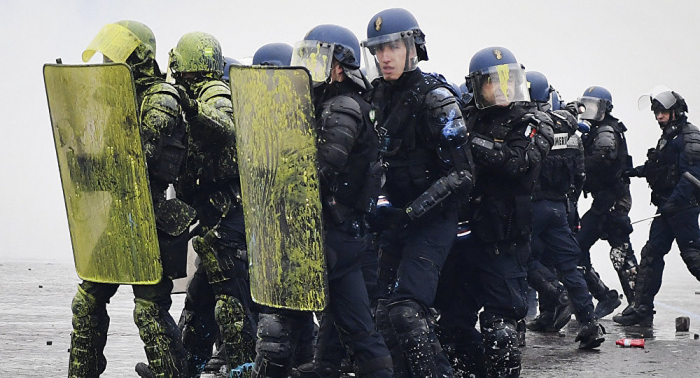 French Prime Minister Eduard Philippe said that around 80 thousand law enforcement officers were mobilised throughout the country, including about five thousand in Paris, Spuntik reports. France is preparing for the ninth weekend of 'yellow vest' protests, which are planned to take place in cities throughout the country. According to the forecasts of the Ministry of Internal Affairs of the Republic, the ninth wave of demonstrations will gather more than 50 thousand "yellow vests" in the country's capital and regions. Paris chief of police Michel Delpuech relayed that radical protesters are expected to participate en masse in Saturday's demonstration. The turnout of demonstrators is expected to be similar to protests in December, when more than 60,000 took to the streets across France, National police chief Eric Morvan told France Inter radio. The wave of so-called Yellow Vests rallies (named after the reflective garment French drivers are required to have in their vehicles) started in mid-November. While the French government has scrapped its planned hike in diesel taxes, which initially sparked the protests, the yellow vests have evolved into a broader movement against unwelcome government policy changes and rising living costs. The rallies have been marked by violent clashes between protesters and police.